I assume this is set somewhere in England, based on the author's bio. It's written from the perspective of Emma, a 13 (or possibly 14?) 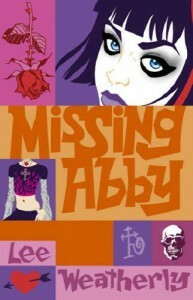 year old girl who realizes that she was likely the last person to see her former best friend Abby before she disappeared. She reports their encounter to the police and is forced to think about a time in her life that she thought she'd left behind and that she desperately hopes no one at her new school will ever find out about. Although a part of her wants to try to continue with her life as normally as possible, she can't stop thinking and worrying about Abby, Abby's last words, and the events that eventually drove them apart. This was aimed a bit younger than the YA I normally read, and some of my issues with it stemmed from the fact that I was too old for this book - definitely not the book's fault. Emma was concerned with how others viewed her in a way that made perfect sense for her age and experiences but that I found extremely frustrating. For example, back when she was friends with Abby, Emma loved sci-fi, fantasy, writing stories, and playing make-believe games in which she and Abby were adventurers fighting against an evil witch named Esmerelda. Some horrible bullying eventually led to her cutting herself off from Abby and attempting to completely remake herself, right down to her hobbies and interests (this isn't a spoiler - it comes up pretty early on). It struck me as a huge and emotionally draining amount of work for something that seemed likely to cause a new set of problems later on. Although Emma's actions and thoughts often frustrated me, I could see where she was coming from. Every time she considered taking the route I wanted her to take - talking to an adult about her plans to find Abby, talking to her friends about the bullying she went through - something came up that made that route seem, to Emma, potentially more dangerous and/or difficult than the alternative. This was a more realistic take on a "missing persons" mystery than I was expecting. Emma wasn't smarter than the cops, although she had knowledge, through her past connection with Abby, that turned out to be helpful. Also, there were no 13-year-olds battling adults in adrenaline-fueled climactic moments - instead, Emma mostly battled her own emotions and the reactions of some of Abby's friends. I appreciated the scene between Emma and her friends near the end, and I liked the way the relationship between Emma and Abby's friends progressed, once I got past Emma and Sheila's horrifically awful first encounters. Unfortunately, one sore spot for me was the way Weatherly wrote about counseling. It wasn't so much Emma's reaction to the idea of it - horror and anger that her family thought worrying about Abby was crazy - but rather that her reaction was never really challenged. One character told Emma that she'd been to counseling before and that it wasn't what Emma thought. In the end, however, Emma's dad decided that it'd be better to just talk and listen as a family more. Readers were never shown that Emma's ideas about counseling were false. All in all, this was pretty good, if occasionally frustrating and exhausting from an adult perspective. I did wonder how dated certain aspects were, though. This was originally published in 2004. The parental controls on Emma's internet seemed to be extremely strict - at one point, she mentioned that there was really only one site that she could go to that at all interested her. And is it still believable for that many parents and teens to be weirded out by teens who play Dungeons & Dragons and like sci-fi and fantasy?